The ZFR-20000-XA is a multi-octave frequency synthesizer operating from 4 to 20 GHz with fast switching capability (<100 µSec) and <-60 dBc spurs across the entire range. The ZFR offers a low profile design for use as a local oscillator in airborne radar applications capable of withstanding high vibration and shock. The ZFR-20000-XA locks to an external 10 MHz reference and exhibits extremely low phase noise at any frequency; <-101 dBc/Hz @ 4 GHz and <-89 dBc/Hz @ 20 GHz, both at 100 kHz offset. The device also features +10 dBm output power, 10 MHz step size, and powered through a +5 V supply with <1500 mA current draw. This small, rugged package (4.5" x 2.5" x 0.6") features SMA RF connectors and a 21-pin Micro-D header for I/O and operates over the temperature range of -40° C to +85° C with extended temperatures available. 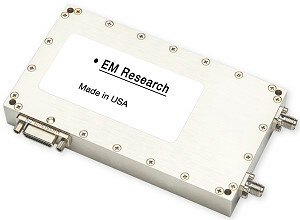 EM Research is the partner that industry leaders trust to deliver innovative, configurable frequency generation and signal conversion solutions with excellent phase noise performance and ultra-low power consumption, all made in the USA to the highest quality standards. With decades of engineering expertise across a broad range of frequency bands, an ISO-certified manufacturing facility and relentless customer service, EM Research provides full spectrum innovation that drives clients' mission success.